Autumn in Davis is always colorful, exuberant, and bicycle-intense. Thousands of new students on campus figuring out how to get around the campus on two wheels (not all are adept, but most become graceful members of the gliding parade in the downtown streets. For me, it’s an annual visit to the United States Bicycling Hall of Fame that re-establishes my ties to the #1 bicycle city in the country. Six years ago, I took a train, but this time I pedaled to the bus, and met up with Peter Rich, father of West Coast road racing in the modern area. As I write this, I’m listening to my hero Dervla Murphy in a 2 hr program (interspersed with music and news from Radio Scotland). She’s the writer/cycler whose books continue to blow my mind upon re-reading….I visited her 3 years ago (blog is somewhere around here). She has just uttered a central truth: that the consumer culture and modern lifestyle is killing the planet and not slowly. But I was going to just surprise my 300 readers (or is it 30?) 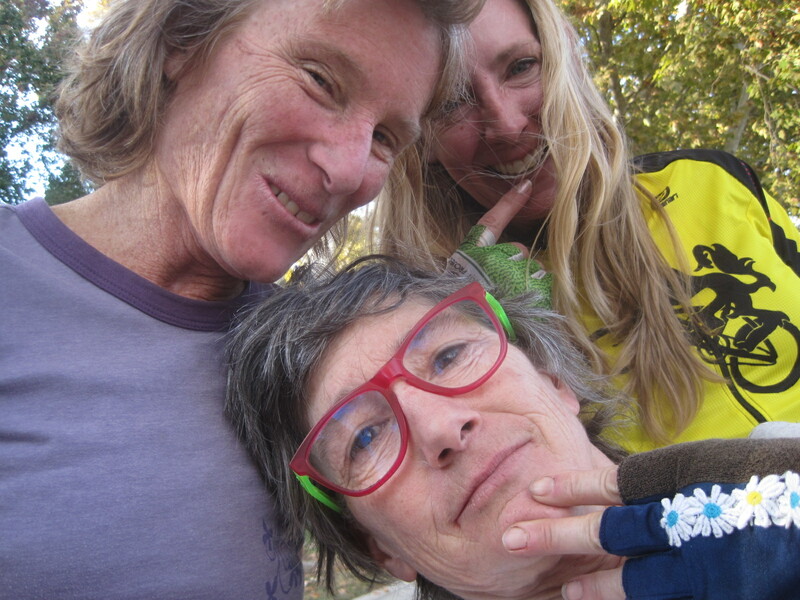 with a note about hanging out with mountaineer and fat tire champion Sara Ballantyne and three time Olympian cyclist Inga Thompson. This year, the Hall puts two women in–a first. I’ve dreamed of, and demanded, an all-women induction year. Please let this still be possible, eh? I met Sara in Crested Butte–when I was the unbeaten champ–and when I couldn’t keep up with her on a long ride out in the aspens, I suggested she race me later that summer and be the first to beat me. She was busy that weekend, but certainly rolled into mountain biking with successes piling up for the next 12 years. 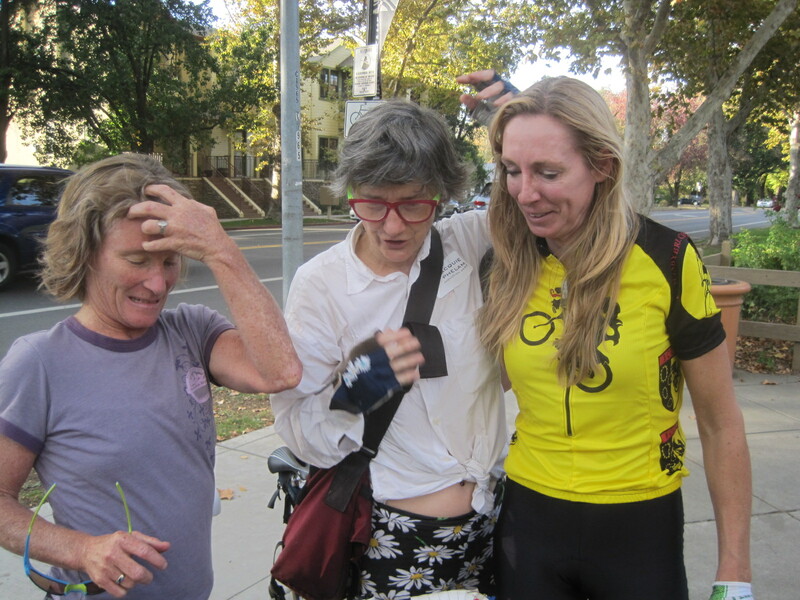 Inga I met before I became a mountain biker—when I was a hopeful roadie, and she was a really raw, gifted college runner in 1984, the first Olympic year that permitted women to ride astride bicycles (before that, we had some track and field, gymnastics and synchronized swimming). I was not quite the future Olympian I’d dreamed I’d be, but about ten years after a pretty fun romp in mountain biking, I undertook a stage race in Idaho and got to really know Inga, and visited her at her horse ranch in Halfway, Oregon. Both of them look as fit as ever, though Inga claims she’s not been on a bike in 20 years. Before the ceremony we three rode with a pack of locals to the nearest town, Winters, 13 miles away. It was windy, and one little pack surge shelled me, while up ahead Sara herded Inga into the dirt along the walnut orchards. “She converted me into a mountain biker!” said Inga, as she gave her brief, touching tribute to a high school running coach who taught her about maintaining a joyful attitude in the middle of arduous competition. Sara spoke of her gratitude to always have been in the right place at the right time–the ground floor of the fat tire boom, for example, and also shared stories about her bagging the Eiger with husband Chris Haaland while at a race in the Crans Montana, Switzerland. I schmoozed with Brooks, Inga’s big brother, and Lee, her little brother (separated by at least 14 years) and was flabbergasted at how supportive her family is…Their mother was also on hand, a gracious woman in pearls, happily witnessing her kid up there in one of mom’s sequined gowns from the 1960s. Very cool. ~ by jacquiephelan on November 9, 2014. Sounds like a splendid reunion! Thanks for taking the time to share! Good to hear from you. I always enjoy what you have to share. Would love to meet Inga Thompson myself someday.